1941 Ford Convertible with chopped padded top, solid grille insert used in Eastern Auto Supply advertising. A Mystery Published Custom Car. Over the years I have come across a lot of Unidentified Custom Car photos in the early Custom Car Publications. Mystery Customs that appeared in just a single publication, and sometimes even in multiple magazines or booklets, but always laking any info on the original builder or owners name. In this series of articles I will be showing some of these Mystery Published Custom Cars, and hopefully the extra publicity will lead to some more information on these cars. The first time I saw a picture of this ’41 Ford Convertible with chopped padded top was in the Custom Cars annual from 1959. The Ford, a typical mid, late 1940’s Custom looked a bit out of place in the ’59 Annual. But it was part of an article about George Barris King of the Kustomizers, and used to illustrate the many years George Barris has been Custom Restyling cars. Some time after I had seen the front 3/4 photo of the car I bought a couple of early Motor Trend magazines. In one of them, the November 1949 issue, there was an half page ad from Eastern Auto Supply. 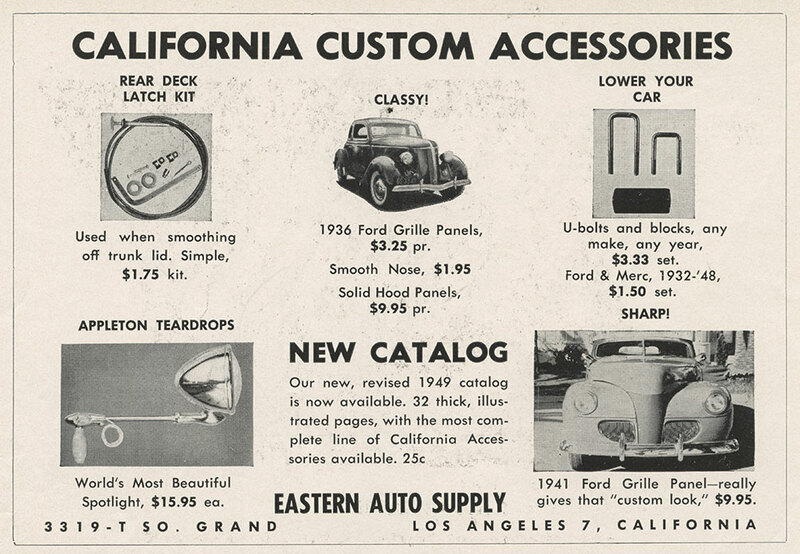 In the ad there was a small photo of an ’41 Ford photographed from the front, with a solid grille panel used to illustrate the California Custom Accessories grille panels. 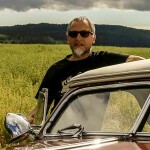 I recognised the primer spots on the windshield frame and the background in the photo and knew it had to be the same car, taken at the same location as that of the ’59 Annual. 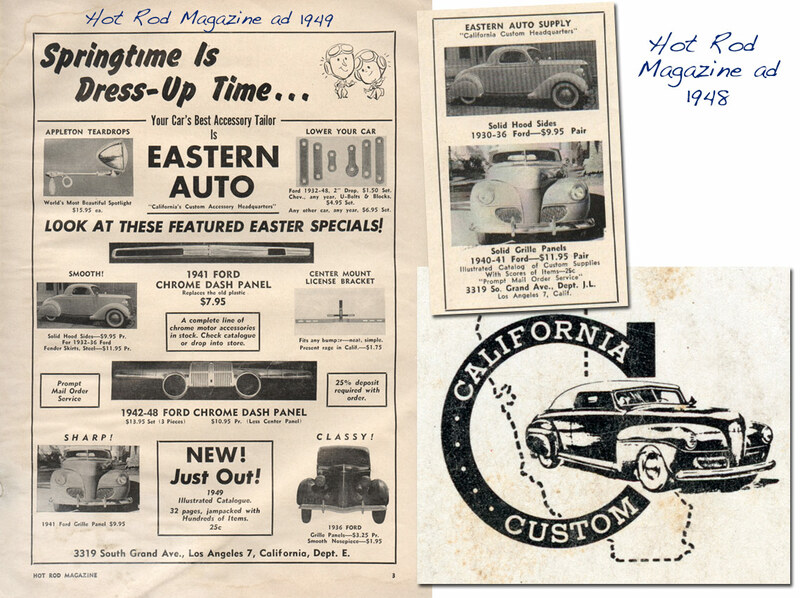 Over the years I have come across many more Eastern Auto Supply ads that use the same photos of the ’41, Also Barris Kustom used the same front view photo in their Hollywood Kustom Accessories catalogue. I also recognised the car on the Barris Atlantic Blvd Shop wall when I did an CCC-Article on that some time ago. But sadly that has been all I have been able to find out about the car. I still have no name of an owner, any dates when it was built, and what happened to the car. A front 3/4 view photo of the 1941 Ford convertible custom was used in the Trend Book 175 Custom Cars 1959 Annual. It was used as part of an story on George Barris. The caption mentioned pushbutton doors, but the car actually has door handles! The first time I have seen a photo of the Ford being used in the Eastern Auto Supply ad was in Feb 1948. This means that the car was most likely built around late 1947. When the photos were taken the windshield had just been chopped and the work had been covered in primer. The car had a straight pillar padded top. 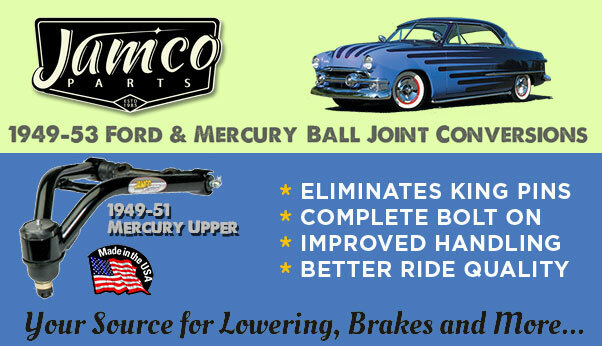 Other modifications were 1946 Ford bumpers, solid grille insert bolted in place (not molded), ’41 Ford/Merc fender skirts. Lowered suspension, shortened side trim on the hood. Chrome rock shield on the rear fenders, radio antenna, Appleton Spotlights, and single bar flipper hubcaps and beauty rings on wide white wall tires. Another indication this was an early custom is that there are no splash pans added to the car. 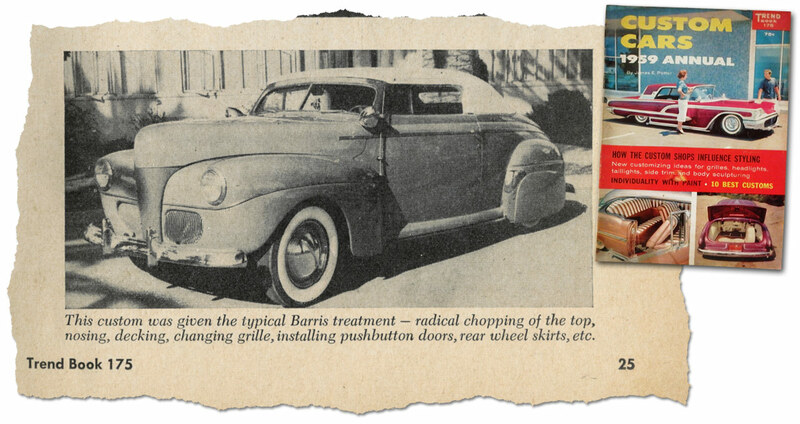 A lot of the Custom accessories used on the car could have come from the Eastern Auto Supply Company, and possibly this car might have been a display case for Barris and Eastern in the late 1940’s early 1950’s. Interestingly the price of the solid grille panel for the ’41 Ford was $9.95 in 1948, the first time I have been able to find its listing, and it was still the same price in 1956, the last time I saw it listed. Eastern Auto Supply Accessories catalogue from 1949. Eastern Auto Supply ad with the ’41 Ford from the November 1949 issue of Motor Trend magazine. The ad was place on the inside of the front cover. 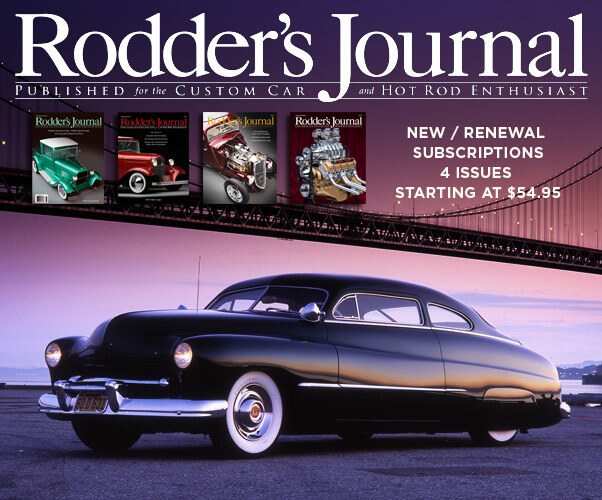 The ’41 Ford front image was used in early Hot Rod magazine ads as well. 1948 Hot Rod magazine ad on the top right, the large full page ad is from Hot Rod magazine in 1949. Perhaps this particular ’41 Ford was used as inspiration for the drawing 0f the ’41Ford on the cover of the ’49 Eastern catalog, which was later stylised and used as California Custom logo (Eastern Auto Supply was renamed California Custom in the mid 1950’s). 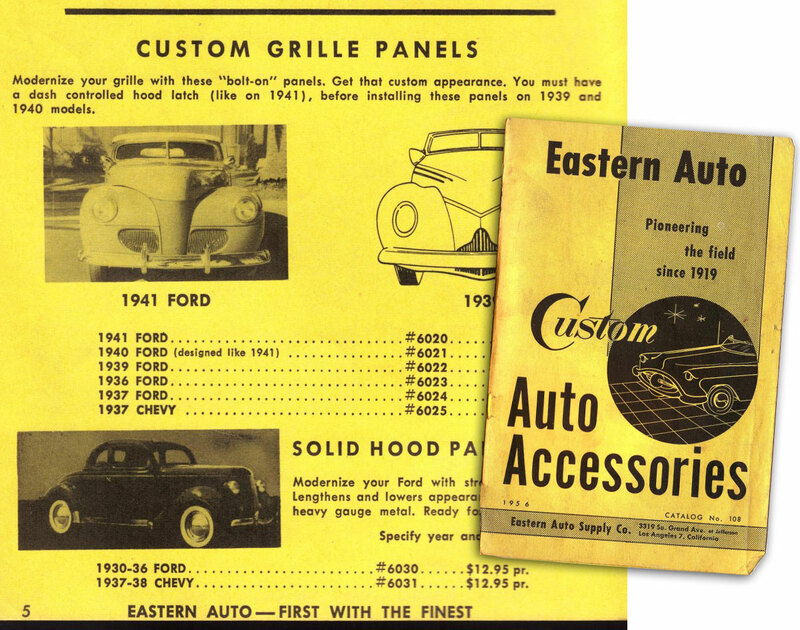 The last sample of the ’41 Ford being used in the Eastern Auto Auto Accessories catalog I have been able to find was in the yellow paper printed 1956 catalog. The price in 1956 was still $9.95, the same price as the first listing in 1948. 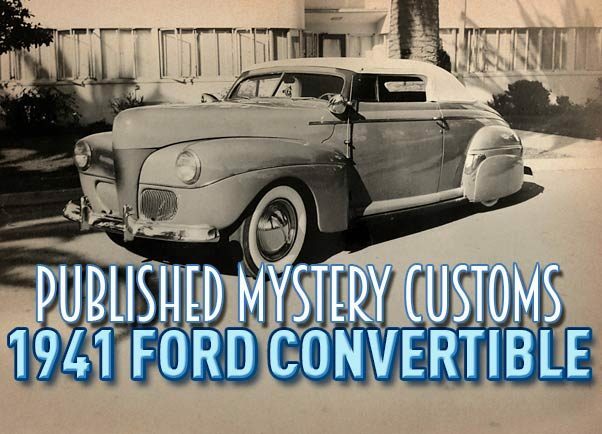 One thing we know about this ’41 Ford Custom Convertible is that it was restyled by Barris at the old Compton Ave shop. The front 3/4 photo of the car was used in the 1959 Trend Books Custom Cars Annual in a story on King of Kustomizers George “Kustom” Barris. Sadly the photo caption in the article did not mention the owners name, or any other info that could lead to anymore info on this car. 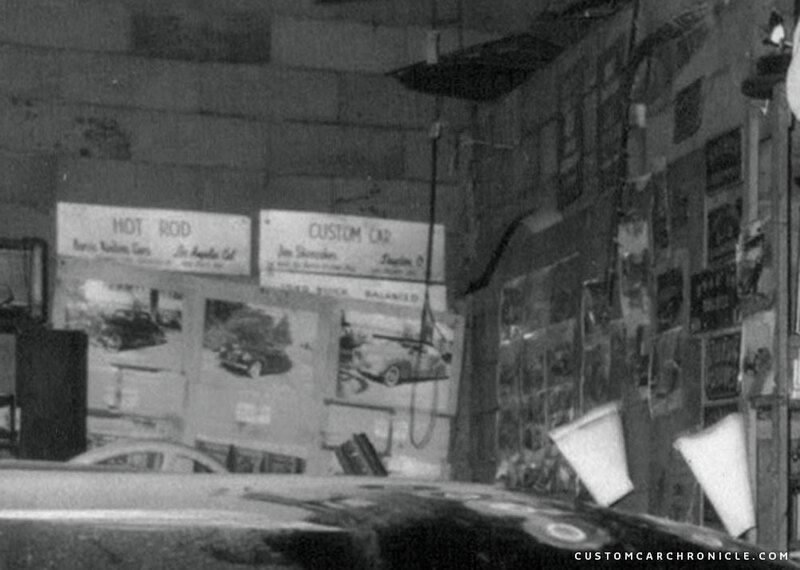 The same photo, as used in the CC ’59 article, was also used on the inspiration wall in the Barris Kustoms Atlantic Blvd shop in the early 1950’s. The way it was used looks like the photo was part of an display, perhaps used at some early Custom Car shows. 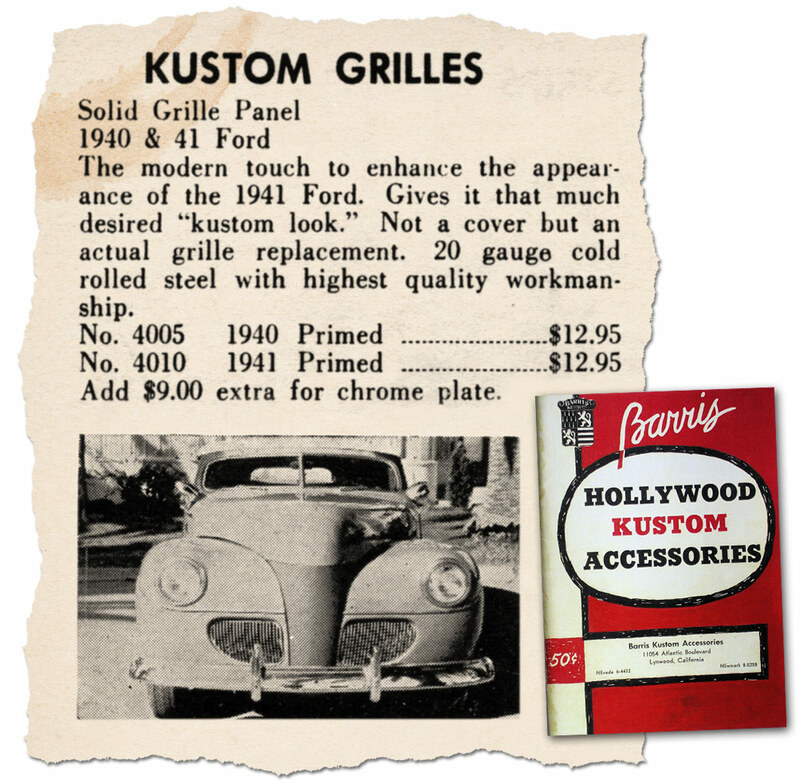 The Barris Hollywood Kustoms Accessories catalog from around 1953-54 carries a lot of products from the Eastern Auto Supply company, including the ’41 Ford Kustom Grille Solid Grille Panel, and it could be ordered in primer (how it was used on the ’41 Ford in the sample picture) or chrome plated. The Barris Shop charged $3.- more for the item than Eastern did! Inside the Atlantic Blvd Barris Kustoms Shop a photo of the ’41 was pinned on the wall. It is the same photo that was later used in the Custom Cars annual from 1959. And the same photo as we show below. 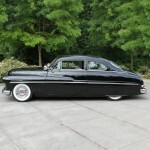 The photo of the Barris Customs created ’41 Ford with chopped padded top, and a series of Eastern aftermarket accessories. The photo was taken at an unknown location that has been used several times for Barris Customs photo shoots. 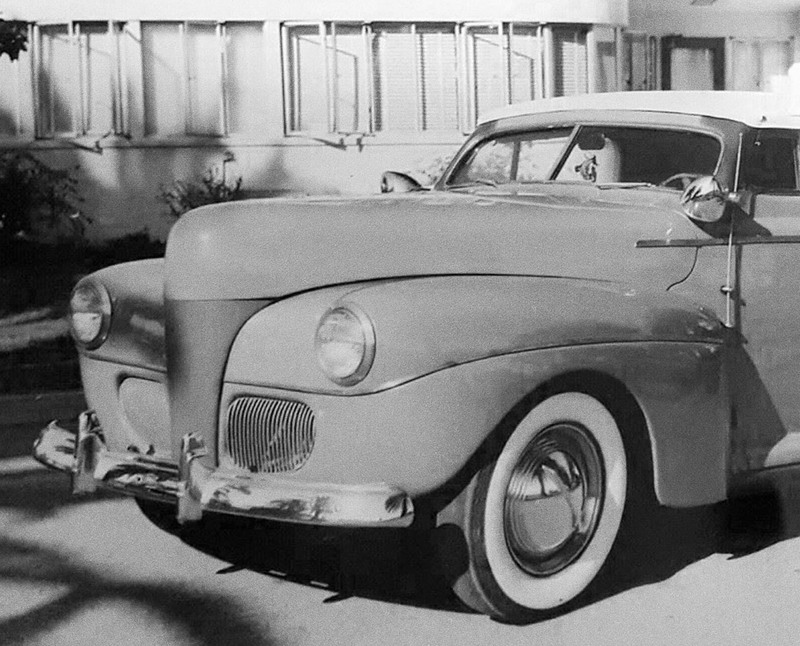 Since the front end photo taken of this ’41 Ford was used in an Hot Rod Magazine in early 1948, these photo of the ’41 Ford most likely were taken in late 1947. Close up shows the freshly chopped and still in primer windshield frame of the car. It also looks if the Eastern center grille insert is a different color, possibly the primer it came in from the store, and that the insert has been bolted in place, not molded in, like a lot of them done by the bigger Custom Shops were done. Since there are primer spots on the windshield from where the A-Pillars were cut and reshaped it might be possible that the Ford is still in its original factory color… a light color, but which one? 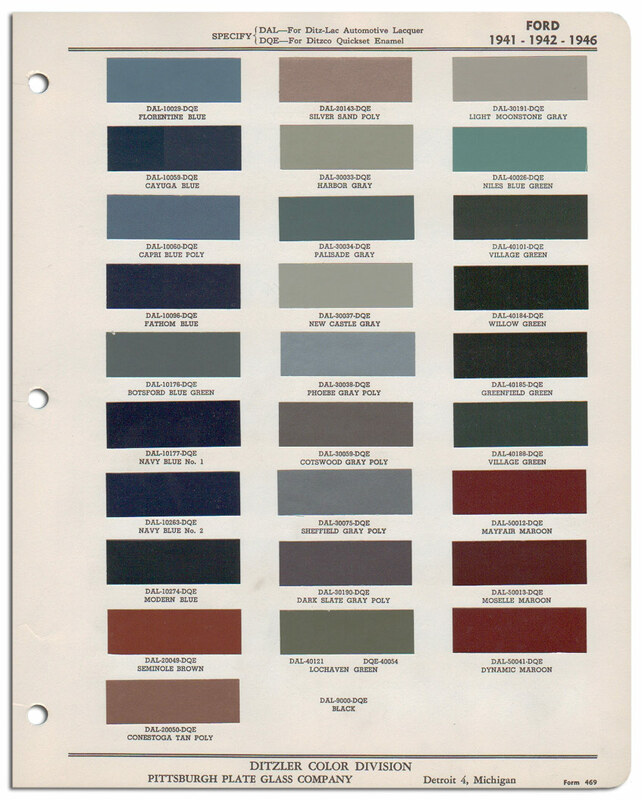 Or possibly the car had already been repainted a custom color when the side trim was shortened? Hopefully one day we will know. 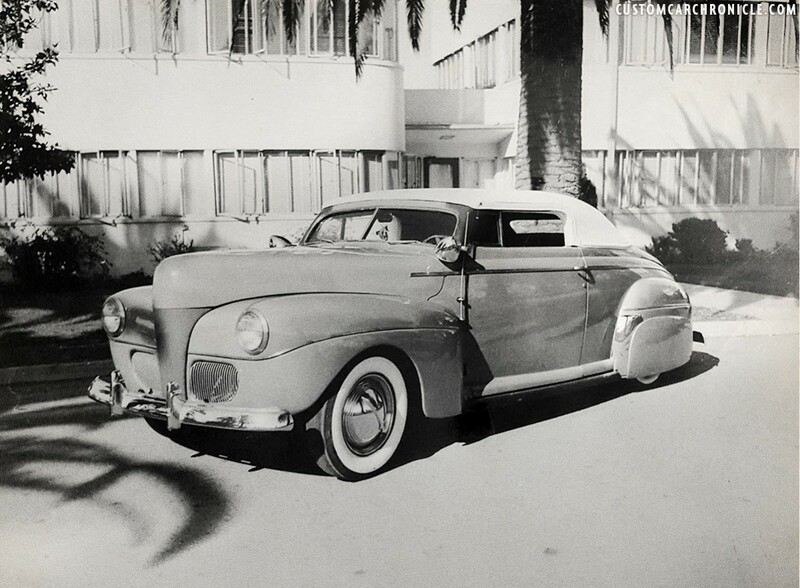 Hopefully one of our readers knows more about this Barris Customs created ’41 Ford Convertible. Who was the owner? what happened to the car. 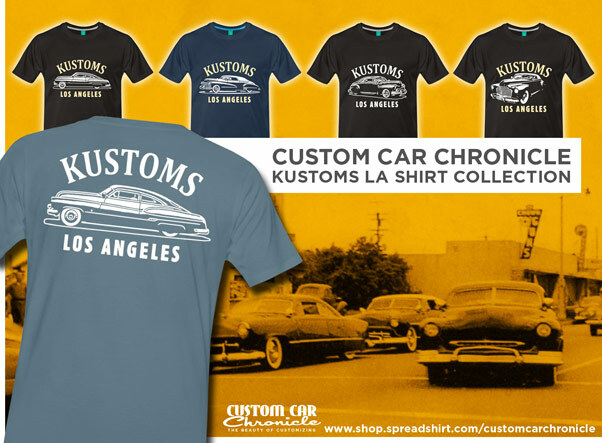 If you have more info, or additional photos of this Custom, please email Rik Hoving here at the Custom Car Chronicle. Any information would be very welcome so that we can solve another Mystery Custom. Another great Mystery Custom article Rik. You would think that with as much advertising that was done using this car some one would know the history of it. I always liked seeing this ’41 convert in the adds and in the 1959 Custom Cars annual. It was representative of an early 50’s chopped convertible custom. I have a Cal Custom sticker with the ’41 convert on an old air cleaner that I am using on my ’32 hot rod project. Clean look…but I think the stock ’41 grill looks nice, too. There was an original kustom that popped up at Paso about 12 years ago – chopped Carson topped, purple, molded grill filler panel…I think it was from Washington state. When it’s molded in, it makes a huge difference.